What’s causing the Rise in Gold & Silver? to destroy the value of the dollar? destroy the value of the dollar? in the destruction of the dollar? Has this all happened before in human history? Why do gold and silver preserve wealth and thus make for a sound investment in these times of crisis? By reviewing these questions we hope to attain speculative intelligence and investment insight. We hope to understand why precious metals such as gold and silver provide financial protection in these economic times of turmoil. So let’s tackle each of these items one by one…. It may seem like common sense, but it is worth asking yourself about the concept of ‘money.’ For example, why is it that people readily take the dollar in exchange for goods and services? What is it about the dollar bill that makes it have value in this manner? After all, it’s just a piece of paper, right? Yes, money makes the world go around, as the saying goes. It provides an easy mechanism by which goods and services can be exchanged, without resorting to a cumbersome barter system of direct trade. If a carpenter wants a chicken for dinner, he doesn’t have to wait until the farmer needs a new barn built – he can use money. But we still have not answered the question. What gives money its value? Today, in America, this is a question which has an answer that is different from what the answer would have been 100 years ago. Back then, there was something behind the American dollar that gave it value. Each dollar represented 1/20 of an ounce of gold. If desired, a person could even receive bullion by trading in their paper dollars – gold certificates could be exchanged for gold and silver certificates for silver. But as we shall see, this is not the case today. The only thing that gives value to the US dollar today is the faith that people have in the US government and its financial institutions. What kinds of things might cause that faith to fade and what would be the consequences? The US dollar was not always recognized as a global power currency. Prior to World War II, Great Britain had enjoyed having the world’s strongest currency – the pound sterling. But in 1931, Britain had to begin devaluing its currency in order to pay for debts accumulated fighting and financing war with Germany. After World War II, the US dollar became the world’s leading currency and as we shall see, the US is now coincidentally undertaking similar devaluation strategies because of its debt. In 1945, after the war, the allied nations got together and instituted a foreign exchange policy, mandating that each member country tie their respective currencies to the US dollar, while the dollar would be directly tied to the price of gold. This was made possible, not just because the US was victorious in the war, but because prior to US involvement, through international trade with the European war parties, the US had accumulated most of the world’s gold reserves. This policy agreement is known as Bretton Woods. The policy allowed the US dollar to become the world’s preferred trading currency – because it was pegged at $35 per ounce of gold, it inspired confidence among foreign nations. In fact, oil and other commodities were denominated in US dollars and transactions between other nations occurred in dollars, rather than either of their own respective currencies. This resulted in a steady increase of US dollars being held in foreign countries’ national reserves and thus began the steady recognition of the mighty US dollar around the world. This situation would last until 1971, when the U.S. had reached a critical point in its accumulation of debt. In addition to the U.S military activity in Vietnam, it had developed a trend of buying more stuff from foreign countries than it sells. This meant that foreign countries were acquiring more U.S. dollars at a faster pace. So, as foreign nations began to recognize that the U.S. may not be able to make good on its dollar promises, the U.S. gold supply was threatened to be over-run. This is why, in 1971, Nixon stopped all convertibility and prohibited the foreign exchange of U.S. dollars for gold, thus killing any remnant that was left of a gold standard for the US dollar. And as for Bretton Woods – it’s also dead. Member countries now need to be content holding U.S. paper in their reserves in lieu of any gold promises. And worse, the US Federal Reserve is now free to print as many dollars as it sees necessary because there isn’t any tie between the US dollar and any amount of gold or silver. This left foreign countries little choice in what to do with the US dollars they were accumulating in their reserves. The only constructive thing they could do was to buy US Treasury bonds – America’s debt. The US pays interest to foreign countries owning these bonds, which, as we will see, is becoming an unbearable problem. The concept of having an American centralized banking system has been the subject of many heated debates among many of America’s forefathers. Whether or not the institution serves us well could be the subject of an entirely different discussion, yet today we have the Federal Reserve (Fed). This chart illustrates how much money the Fed has been creating since inception. Instituted in 1913, the Fed’s monetary creation remained relatively mild up until Nixon removed the last remaining thread of the gold standard in 1971. At this point, since there doesn’t have to be any gold backing the paper currency, there is nothing to stop the Fed from printing as much money as it needs for anything it desires. On the chart, one can also easily pick out the relatively tiny blip from the 9/11 disaster. But the thing that should really grab your attention is the unprecedented money creation that started with the ‘crisis’ of 2008! This monetary build-up has dwarfed everything up to that point. So what caused this sudden spike in money creation? If you recall, back in 2008, the US Treasury, Federal Reserve and leaders of about 10 of the biggest banking institutions had secret ’emergency’ meetings and pledged what they then said was $700 billion to stave off disastrous peril of our banking system. Turns out more than $3 trillion was actually thrown at the situation (and we aren’t even close to having solved any of the problems). Here are some of the articles that give more information about these bail-outs: Bloomberg, Washington Post and the Wall Street Journal. Reading those articles, one can see at least two things that may be a bit surprising. First, the institutions getting emergency aid were not limited to the U.S. – there were plenty of foreign banks and institutions getting money from the Fed. Second, it wasn’t limited to banks, but included some large companies too, like General Electric and Harley Davidson. Apparently, US leadership bought into the idea that letting Harley Davidson Motorcycles go bankrupt would contribute to a disastrous peril of our banking system. While it is true that many of the firms have now paid back the initial bailout funds, it should be noted that the Fed did not fully disclose all the information necessary to gain a complete picture of what happened. They did not indicate what each institution was putting up as collateral for this easy, low/no-interest money. This is probably because it was either toxic or non-existent. And all of that crap is still out there on the books, even though, according to those accounting rules instituted in early 2009, the books do not have to reveal the current market value (=0), but can mark them as what they would be worth if there were buyers and the economy was in good shape. If the truth were known, we’d have a full-on panic right now. This leads us to the Quantitative Easing strategy the Fed has been employing. QE-1) Soon after those bail-outs, from the end of 2008 to the beginning of 2010, the Fed purchased Treasuries and mortgage-backed securities to prop up Fannie Mae and Freddie Mac to the tune of approximately $1.5 trillion. QE-2) On December 5th, in a 60 Minutes interview, Fed Chairman, Ben Bernanke said that he will keep printing money as he currently sees no other way out of this ‘economic slow-down.’ QE-2 is now underway, and if you think it will be limited to the $600 billion figure he’s mentioned, think again….. it will end up being much more! Here’s the 60 Minutes interview in case you missed it: Part 1 & Extended 2. He discusses deflation as being a real risk, which is heavily misleading. The Fed officially uses flawed techniques and data for measuring inflation (on purpose, of course), and deflation is actually a great thing for people who save their money. But the banks end up the losers in a deflationary economy and since the members of the ‘inner circle elite’ own all the banks, Bernanke will strive to protect them. In order to protect against deflation, the Fed is going to step in and buy U.S. Treasury bonds to the tune of $600 billion in the next 6 months, and probably continue afterwards. This, the Fed hopes, will keep interest rates down because as fewer foreigners are showing up to buy our ridiculous debt at these Treasury auctions, someone else has to step in and buy in order to keep those interest rates from climbing. (China, for example is becoming less willing to accept such low interest on US bonds, especially at such high risk due to the growing level of un-payable US debt.) Interestingly, this intended strategy has back-fired as interest on these bonds have been rising recently, indicating more problems ahead. QE-3) We should expect to see at some point in the future a state and municipal bail-out package from the Fed. American cities and states are in a similar situation as that of the European community and will need to be bailed out soon. QE-4) It is likely that the real-estate collapse will continue, so we might expect to see a bail-out specifically to prevent the banks from taking huge losses on un-sellable properties they’ve taken over. Once the ‘paper-work’ issues of the foreclosure crisis gets cleaned up, property seizures will most likely resume its rapid pace. Concluding from all of this, the chart above has not yet finished it’s upward spike because, as already noted above, Bernanke is at this moment cranking up the printing presses again with QE-2 and will probably continue well beyond that point with QE-3, 4, …., n.
Most of the public hears these huge amounts of trillions of dollars and doesn’t even realize what is being discussed. But this page gives a nice representation of what a trillion dollars would look like if you were to have the physical cash stacked up in a huge warehouse somewhere. Yet the Fed acts as if all this cash is simply Monopoly money by its seemingly unending printing activities. After reviewing the Fed, some may wonder why we are now having a separate discussion on the government, as it may seem somewhat redundant. But contrary to popular belief, the Fed is not controlled by the US government. Rather, it’s an independent institution within the government. The Quantitative Easing strategies discussed above are separate from stimulus actions launched by congress. The following chart is taken from Babylontoday.com, and was generated from US Treasury data. It gives a graphical view of the historical amount of US national debt since 1950. How, in the name of God, did we allow our national debt to get to this ridiculous level? To understand what led us to this debt burden, we’ll now look at the wonderful world of politics and how it generates a perpetual cycle of government spending more than it receives in tax revenues. Politicians rely on democracy to attain and retain their jobs. That is, to get elected, they must get the votes. To get the votes, they make promises. Candidates have been notorious for making promises to benefit a certain demographic or a certain group or organization. In order to get elected, candidates avoid the difficult questions like those put to them about the fate of Social Security or Medicare, which face revenue declines and beneficiary recipient increases. They know that the demographic relying on continued benefits from these programs do not want to hear that those life-lines may be cut. So, they remain silent. To make matters even worse, some organizations sponsor certain candidates by donating money to their election campaign funds. And in early 2010, there was new legislation passed that allows unlimited funding in this manner. In turn, this sometimes makes the elected officials somewhat beholden to those organizations and they are easily swayed by lobbyists – another tool used by organizations to subvert US lawmaking. The result of all these kinds of politics is that candidates do not think long-term. They only concentrate on what will keep them in office in the near term. They avoid discussing the real cuts that are necessary to reduce the deficits, because they would be too painful for many citizens, which in turn, would not be good for their political careers. So they spend money the government doesn’t really have in order to satisfy the voters – they borrow from the future, believing that by the time the debt comes due, either it will be someone else’s problem or there will be some other distraction to avoid attention and extend debts even further. To understand this political impact on the US national debt, let’s examine some of the recent programs and stimulus packages that have been launched by the US government. American Recovery and Reinvestment Act of 2009: Under President Barak Obama in early 2009, this was a package of nearly $800 billion to stimulate the economy. The US consumer was tempted by ‘cash for clunkers’ (=$3 billion) and home buyers tax credits (=$22 billion). Jobless benefits were also extended due to the seemingly never-ending unemployment outlook (=$319 billion). Patient Protection and Affordable Care Act: With a democratically-dominated congress, this health care reform bill was passed and signed into law by President Obama at the end of March, 2010. The package has been estimated to be a cost of $1 trillion over the next 10 years. It is still unclear where this money will come from because there are still legal battles being fought over the finer points of the measure. Tax Relief, Unemployment Insurance Reauthorization, and Job Creation Act of 2010: Again under President Obama, this package extends the tax cuts initiated under President Bush and has an estimated price tag of $858 billion. Tax cuts are usually welcomed by citizens, but can we afford it? It’s getting a bit absurd, isn’t it? The US is already slated to spend $1.2 trillion more than it has for 2011 on top of an existing published debt of nearly $14 trillion. Until the politicians are willing to face this reality and stop acting solely on their own concern for future votes to remain in office, they will never be able to make the difficult decisions to reduce the deficit enough to pay down this debt. Tax cuts and welfare benefits are nice, but if drastic spending cuts are not made, the only way to pay for these nice things is to debase the dollar further by printing more money. The economies of the world have been increasing their dependence on debt. As we have seen, the US has been leading the way. The policies employed by the US Fed, keeping interest rates at record lows, and the government, passing stimulus packages, have been relying on the consumer to keep the economy running by spending their money – money they don’t really have – on new cars, new houses, new appliances, etc. They are hoping that this spending will counteract the recent downturn in the economy. But most consumers are either waking up to the fact that they are already stretched too thin or the banks have become more restrictive in their lending due to their own balance-sheet problems. Since the turn of the century, the Fed’s policies have made the acquisition of credit extremely easy, which meant more people could buy expensive homes at inflated prices. It wasn’t until the sub-prime mortgage crisis started to hit in 2007 that people started to realize that the large increases in home values were basically an illusion. Real-estate prices had been going higher simply because the banks were willing to lend ever increasing sums of money to people, many of whom had questionable credit worthiness. At some point, this so-called housing bubble had to burst, which it has and will probably take a while to correct. As a result of this mess, more consumers are finding that they are too far in debt and struggling with their finances. The chart below is from NPR. Immediately below is the historical household debt for the US consumer, which has been steadily rising, but has begun to taper off in recent years. This may indicate that the consumer is either unable or unwilling to take on new debt. The consumer is not spending at the rate they had been in the past. And their savings rate, although seemingly on the rise in recent years, is still far below overall average historical savings rate of 8% of disposable income. It should be noted that there is little encouragement coming from the Fed and banking institutions – they are not providing the incentives to motivate people to save. Interest rates on savings accounts are averaging only about 1.1%. All this, combined with the poor unemployment outlook, reveals the real reason why the Fed and the US government have subsequently accelerated their monetary expansion in the last few years – they must replace the consumer as the primary economic engine by spending enough to close the gap. In fact, the slight (and temporary) positive affects in the economic data recently are solely attributable to government growth, not growth of any significance in the private sector. With the Fed repeatedly going to the printing press to gin out more paper money, the government’s unwillingness to divert from its deficit spending sprees, and the average citizen unable to balance personal spending with adequate savings, one has to wonder what all of this is doing to the value of the dollar. 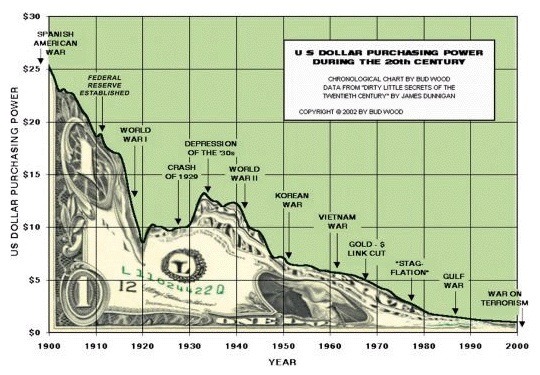 This chart shows what has happened to the US dollar’s purchasing power since the Fed’s inception in 1913. Using the US government’s measure for inflation – the Consumer Price Index (CPI) – the dollar has lost 96% of its value over the last 100 years. And with all that has been discussed above, it looks like this trend will continue until the dollar debasement is complete. The US dollar is definitely in decline, as should be obvious by now. But it’s not alone. At this time, all major currencies around the globe have departed from the gold-standard and adopted fiat currencies, with no backing other than the trust in their respective governments (with the possible exception of Malaysia, now experimenting with new gold and silver currencies). A government subscribes to the use of fiat currencies in order to be able to spend money it doesn’t have. It simply prints up money when it needs to expand governmental programs or go to war. The governments will be successful in this effort as long as the public ‘trusts’ their leaders to be fiscally responsible. But citizens all over the world are waking up to see that their leaders are corrupting and debasing their currencies by printing too much paper money. Case in point: Europe. Recently, starting with Greece, the European Union has been struggling with too much debt among some of its weaker member states. The so-called PIIGS countries (Portugal, Ireland, Italy, Greece and Spain) are so far in debt, that it has caused genuine concern that their debt problems might end up breaking up the union and throw the Euro, that relatively new currency of the European bloc, to the garbage bin. So the EU along with the International Monetary Fund (IMF) launched a $1 trillion package to save the union and the Euro. And, by the way, the US and other countries around the world contributed to that bail-out package via the IMF. Unfortunately, this $1 trillion dollar European bail-out package is not sufficient to save all the EU countries in trouble. First, the fund really isn’t as big as $1 trillion, because the member countries contributing to the bail-out fund include the countries being bailed out! (How can a country that doesn’t have any money make any contributions to help pull itself or another country out of the crisis?) Second, Greece and Ireland have now taken approximately $250 billion out of the EU package. It’s estimated that Portugal will take out another $100 billion. Then, once Spain and Italy start down the same path, the fund will need to be increased because the expectations there are $450 billion and $1 trillion, respectively. Because of the US banking industry’s exposure to European debt, the US may once again be asked to join with the IMF to help prevent the European Union from collapsing by giving more monetary aid. The IMF, in fact, has already suggested an increase in the bail-out fund in anticipation of Spain’s debt problems. Sound familiar? It’s the same story, just different geography. stronger exports. But again, this is only temporary. As other countries recognize this trade impact, they too will take actions to devalue their own currencies to improve their trading and economic activity. The net result is a global currency war – a race among all nations to devalue their currencies against each other. In such a global economic environment, all individuals who keep their wealth in financial instruments denominated in fiat currencies will suffer the biggest losses. On the other hand, owners of hard assets such as gold and silver are able to preserve their wealth. As Rome began to fall, there were similar things happening that we see today in our modern society. There was a kind of welfare system, allowing for the dispensing of free bread to those that qualified. Additionally, the Roman republic had a tax system. Included in that system was a taxation of farmers where a certain percentage of crops had to be given for the purposes of feeding the civil servants and soldiers. As this tax percentage increased due to these welfare programs and war activity, farmers began to feel the pinch and decided it was better just to grow a small amount for their own family, and perhaps a bit more for the sake of the government. But soon, the laws were changed so that a farmer had to give a certain tax percentage according to the size of the land the farmer had – so it forced them to work even harder – and for less return on their labor. As this continued, farmers were walking off their land, giving it up and moving away – expatriating. started issuing bronze coins with silver plating by the millions. In 301 AD the coins issued were only 2% pure silver (a 98% debasement). dollar. But by 1923, the Weimer government had printed so much paper money that the mark hyper-inflated to a level of more than a trillion marks to the dollar! There are numerous other examples in history of nations inflating their currencies to death: the French assignate during the French Revolution; the Chinese yuan during the period after 1934; and just recently during the years between 2003 and 2008 in Zimbabwe. In view of all these monetary fatalities, it seems many of today’s nations are on the same path using similar currency practices and political policies, with the US leading the way with the debasement of the dollar. After understanding the issues above, one does not need to be an economic genius to see that the price movement of gold and silver is not due to the changing values of those metals. Rather, it’s the value of the dollar and all other fiat currencies that are collapsing! Precious metals act as a hedge against inflation and the destruction of a fiat currency. In our current world economic situation, it really is a necessity to own physical gold and silver. However, it is not suggested that one rush out and buy these precious metals at any price. Nothing ever goes up or down in a straight line. There will be inevitable corrections, which should be utilized by the intelligent investor to add to existing holdings. Given that the fundamentals discussed above do not change (and at this point, there is little chance of the kind of changes necessary to turn things around), in the intermediate to long term, the value of these precious metals will continue to rise in relation to the world’s baseless fiat currencies.